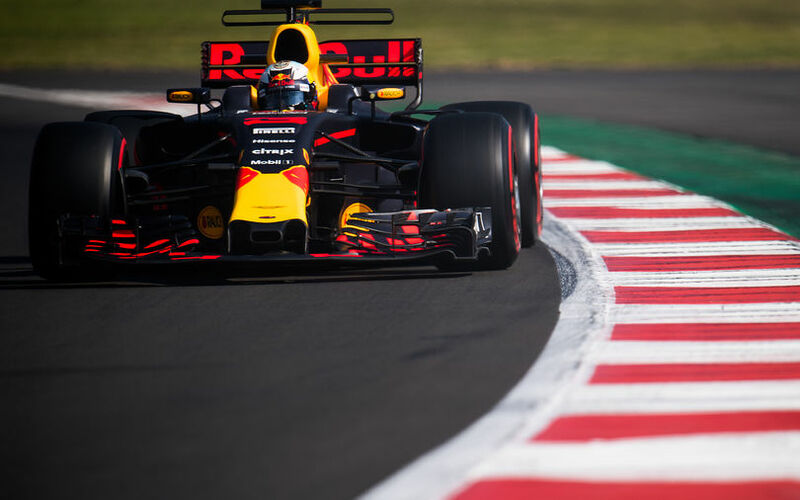 Daniel Ricciardo topped the second free practice session at Mexico, even though his advantage was just tiny. Lewis Hamilton and Max Verstappen were both within less than 2 tenths of a second from the Australian Red Bull driver. Ricciardo seemed well at ease as of the start of the session. The track seemed to have a evolved somewhat from the slippery slope that it was early on in FP1, but still saw many get caught out. The Australian Red Bull driver seemed unfazed and was among the faster drivers during the entire session. For Sebastian Vettel, the session was rapidly disturbed as his car's fire extinguisher mistakenly went off. Vettel initially reported his seat getting cold, before saying "Ok, something burst... aaagh, it's like some acid or something". He returned slowly to the pits, where he got himself into a spare suit. 20 minutes later, the German was back on track, only end up off of it again at Turn 11. No harm done however. Lewis Hamilton seemed to struggle a bit as well, with several spins and off-track moments. Stroll and Sainz were among the others that also spun at various locations around the track. Max Verstappen was hit by technical trouble, as his engine retired itself half an hour from the end of the session. Instructions from his engineer were useless, with Verstappen saying "I know, it's certainly not good. I have no speed". The team soon after noted it was to be the end of Verstappen's FP2. Romain Grosjean and Pierre Gasly also had premature ends to their session. Brendon Hartley on the other hand did run until the closing stages, but repeatedly noted to hear and feel strange things about his engine. Hulkenberg nearly made it, but stopped running 7 minutes from the end after his team reported his car to be "extremely hot".